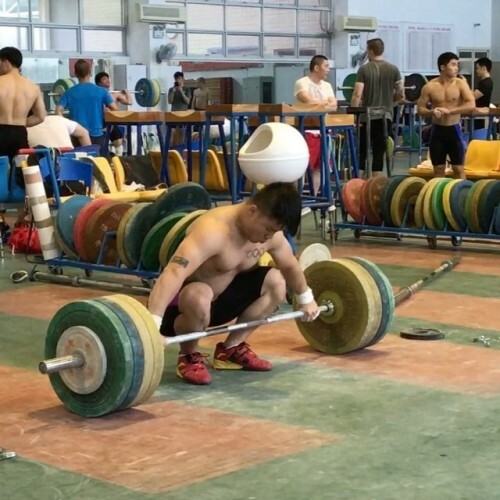 Yuan Chengfei (77kg BW, 2017 Asian Champ – SN 160kg & CJ 195kg at that comp) hitting 150kg and missed 155kg behind (swipe left). The Chinese emphasize driving the quads into the bar and using the legs to push the bar up. This can be conceptualized by imagining yourself preparing to do a broad jump as the bar is crossing the knees. You are obviously not trying to jump forward but instead you are trying to drive by pushing the bar up. I’ve done an edit by first playing it in real time and then slowing the video down in the second repeat. You can see as the barbell is passing the knees that the legs and seat of the hips start moving forward towards the bar. If that is not obvious, look down at his feet and notice how the heels start breaking off the floor. This is a symptom of the legs and hips driving through under heavy load. This post is to showcase what is taught at the schools I have been visiting and the concepts they use to teach the technical foundations of their movements. If you are to try this on your own, your aim is not to try and consciously lift your heels up or lift through the forefoot. What’s happening in the video is unconscious and happens naturally as the athlete tries to bring the bar to the power position to initiate the final extension. Bonus Edit: There are so many Olympic, World and Asian champions here that it is seriously getting hard for me to keep track. Thank Buddha for @iamjwjw for being my Asian elite athlete Wikipedia. He’s gonna put together a list of all the champs training at this location so you guys can see just how stacked this place really is.